The children have been going around to all the local churches VBS programs. This is one of the cute crafts they brought home. 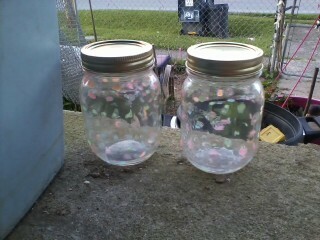 Jars, little mason jars, with little splotches painted on them. On Amazon.com, it says to make sure when you paint them to put on enough paint, like little blotches, so it will glow after being exposed to light. They are so cute. Even if they didn't glow, the little jars are precious. When they are exposed to light, they glow when it gets dark. When I saw how cute they were I had to share this simple craft. It works best to have dots of thick paint on the jars, that way they absorb more light.